After leaving School, aged nearly seventeen, he spent some time working in an architect's office in Darlington. However, his real interests lay elsewhere. In the next ten years or so his passion for ornithology was more research centred and the camera became a tool in furthering his studies. The combination of birds and photography was a new venture and he recounts how an expedition to photograph Gannets on the NE coast was a turning point in his life. His technique was to secure his rope to a metal stake driven into the ground at the top of the sea-cliff. 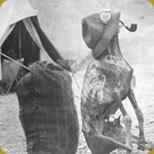 He tied the rope around his waist and inserted one of the tripod legs into his waistband leaving the other two free. His brother, who often accompanied him, would keep a keen eye on the proceedings as he descended to the nest and later made is way back up the cliff. On reaching the nest he would take the other two legs of the tripod and push them against the cliff so steadying himself and the large, heavy, Sanderson half-plate camera. The photographs having been taken he retraced his steps and climbed the cliff which he found absorbing and requiring skill. Such was the challenge and enjoyment in climbing sea-cliffs that it gave rise to a growing interest in climbing per se which took him to Wasdale Head in the Lake District then regarded as the centre of English rock-climbing. Here he met Howard T. Somervell the son of a well-known Kendal shoe manufacturer. Before the 1914-18 war they explored the classic climbs of the Lake District, and in doing so developed a lasting friendship. 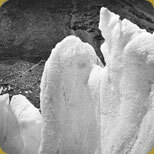 The period 1903 to 1914 was spent in field research, writing and publishing, photography and lecturing. 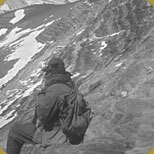 In 1911 he had been a member of the ill-fated Jan Mayen Island Expedition. Altogether he acquired a wealth of first had experience and knowledge which secured him a place among the leading ornithologists of his time and commended him to the Governors of the North Eastern County School. 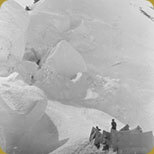 Climbing activities came to a halt during the war, but afterwards he and Somervell teamed up again and soon came to realise that one sizeable omission in their repertoire was experience of snow and ice. They made contact with Godfrey Solly, a veteran climber aged 60, who had climbed extensively in the Alps before the 1914-18 war. He agreed to take them to Chamonix and introduce them to Alpine climbing and techniques to use in snow and ice. They spent two holidays with Solly and then progressed to guideless climbing. Beetham continued his exploration of the major climbs in the Alps, a fact which undoubtedly influenced the Mount Everest Committee in their selection of members for the forthcoming 1924 expedition.